Watercolor Lithograph Colorful panels of landscapes, architectural sections, and portions of walls and buildings surround the text in this contemporary watercolor lithograph. 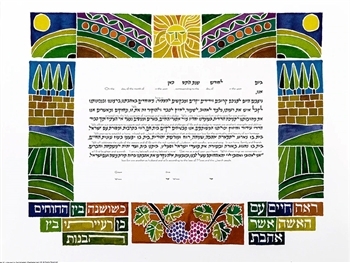 Expressing the spirit of both the old and new Eretz Yisrael, the Biblical verses on the border of this Ketubah speak of the love between the bride and groom. Limited edition, each Ketubah is signed and numbered. 20" x 15"
Gad Almaliah was born and raised in Jerusalem. He graduated from the Bezalel Academy of Art in Jerusalem and studied at the school of Visual Arts in New York City. The Mexican Government sponsored him to work with Mexican Artists at the University of Mexico. Gad served as president of the Graphic Designer's Association of Israel for 15 years. Gad has designed postal stamps for the Israeli, United States and Mexican Postal Services. In addition, the Israeli Government commissioned him to design coins and medals as well as the emblem for the six day war. He has produced books on design and numerous posters. Currently, Gad resides in Boston. He designs and produces Judaic sculpture and ritual objects. He is on the faculty of the School of Visual Arts in New York City where he teaches design.